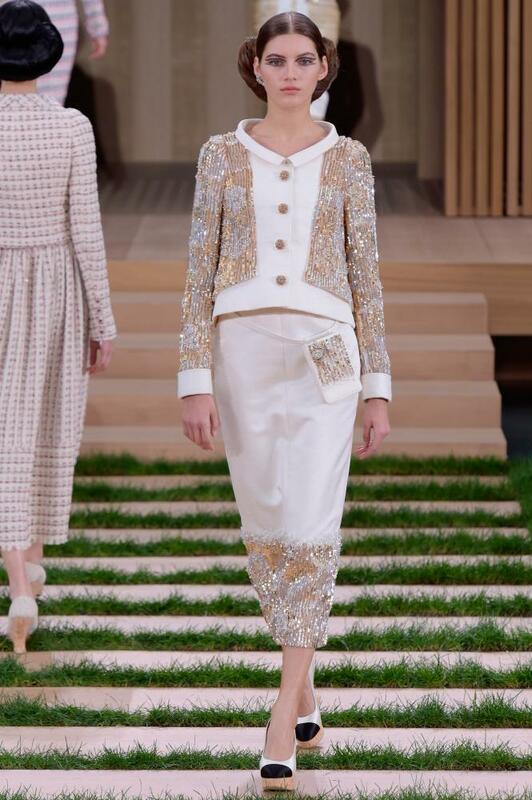 At Chanel, the show starts long before the clothes appear. Karl Lagerfeld’s overture began a few days ahead of this collection with the show tickets: simple slabs of eco-friendly plywood looking nothing like haute couture’s traditional beribboned and gold-embossed invitations. Once inside the Grand Palais on the day of the show, guests found themselves transported from the leaden skies and frenetic streets of Paris to a blissed-out, spa-like stage set, with a painted blue sky lit by floodlights and a backdrop of trees in full leaf. A minimalist pavilion in slatted wood sat in the centre of a lawn edged by paths picked out in yet more pale wood. The natural idyll was a notable departure from Lagerfeld’s recent Chanel shows, which have been staged in a Paris street scene (September 2014), a cafe (March 2015), a casino (July 2015) and an airport (October 2015). The presence of the ethical fashion campaigner Livia Firth in the seat next to Anna Wintour was another final clue to the theme of this collection, which Lagerfeld said later was about fashion and natural resources. The set would be recycled immediately after the show, he said. The setting represented nature at its most chic. The final prop was Cara Delevingne, who made a late arrival in the front row cuddling her husky puppy, Leo. It was the perfect backdrop for Lagerfeld to apply the skills of his couture ateliers to making beautiful clothes out of natural, sustainable materials. This summer’s two-tone slingback sandals came not in leather, but in environmentally friendly cork. A skirt was woven out of jute, and embroidery fashioned from tiny paillettes of wood. Lagerfeld has touched on the eco theme before, most notably in 2010 when he imported a giant iceberg as a centrepiece of a Paris catwalk. That day, however, he told reporters that his inspiration was a Swedish ice hotel, rather than the melting of the polar ice caps. Lagerfeld is constantly engaged with the world around him – last year his shows made reference to French national identity, and to modern feminism – but in the end, it is fashion and fashion alone which he takes entirely seriously. The key message of this show was that longer length straight skirts and cropped wide-legged trousers – the same silhouette, in effect – are chic for spring. Day looks were streamlined and simple, with jackets cropped at the waist, and fabrics stiffened to hold a constant shape. There was an air of tranquillity, even beatitude, which had something to do with the notable absence of distracting, buy-me accessories – the only handbags were simple pouches slung around the waist – and something to do with the languid pace dictated when wearing very high platform sandals and very long skirts. The mood was reflected in the elaborate “Chanel croissant” hairstyle that seemed to fuse geisha styling with Scarlett O’Hara. The elongated flicks of black eyeliner were an idea taken from Picasso, Lagerfeld said. 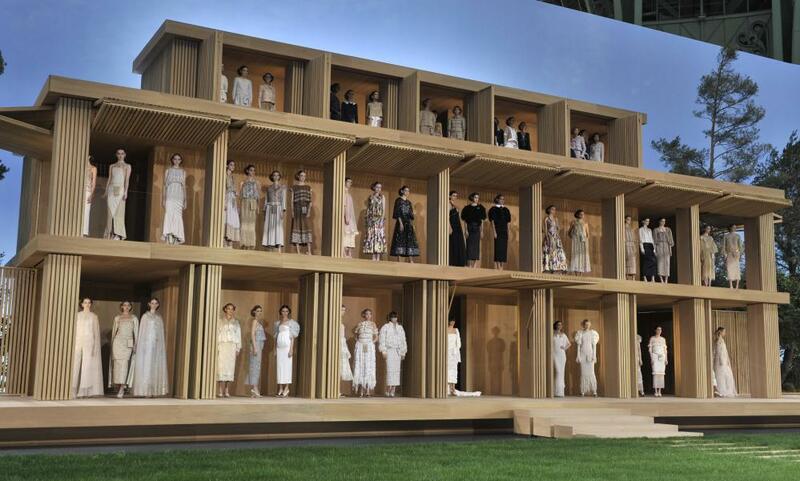 At the close of the show, the screens of the wooden house retracted, revealing 19 rooms with two or three models posed in each, a vast and absurdly elegant dolls’ house. With the Oscars a month away, eveningwear is front of mind at haute couture week. Lagerfeld dressed two of the supermodels of the moment, Kendall Jenner and Gigi Hadid, in looks designed to catch the eye of red carpet contenders – including, perhaps, Diane Kruger and Gwyneth Paltrow, in the front row. Jenner wore a dramatic, multi-strapped black goddess gown, while Hadid’s pale gold column dress was topped with a shimmering cape to match.